Dave Todd will head to South Coast Raceway’s South Coast 660 – round six of the 18/19 Summit Racing Equipment Sportsman Series – this weekend buoyed by recent victory at the Portland (Victoria) venue. It didn't take long for two of Australia's foremost drag racers on methanol to return to the top of their respective categories this 400 Thunder season. New Year's Thunder doubled as a split round for the 400 Thunder Sportsman Series with Pro Radial, Competition Bike, Top Sportsman, Modified and Super Street in the hunt for championship points. There's no doubt about just how tough some of the cars that take to the road for Street Machine Drag Challenge are, but one of them has proved its credentials in a different arena, taking out the dyno comp win at Summernats. Queensland's Kelly Bettes lived up to her championship-winning reputation at New Years Thunder at Willowbank Raceway on Saturday night, recovering from a first round mistake to take out the final round from America's Ashley Sanford. 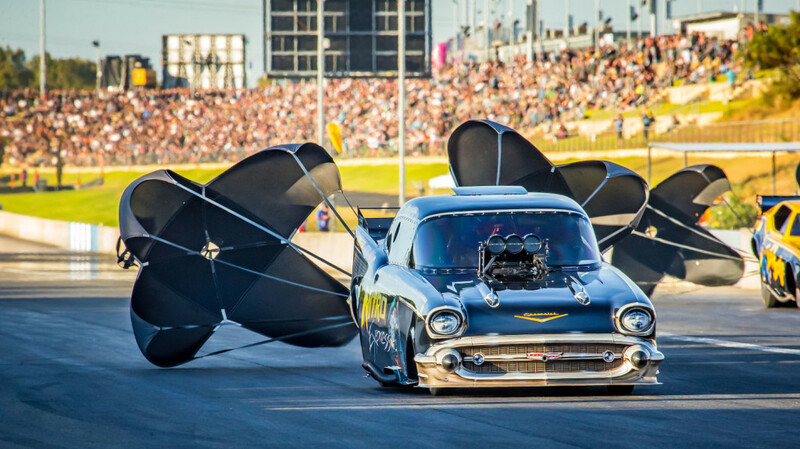 The Aeroflow Outlaw Nitro Funny Car series is set to return to Sydney Dragway as part of one of the biggest one-day spectacles ever seen at the venue – the Gulf Western Oil Mega Race on April 6, 2019. Kelly Bettes said she feels lucky to be alive after a scary moment a couple of days after the New Years Thunder Top Fuel event at Willowbank Raceway. The Aeroflow Outlaw Nitro Funny Cars once again rocked Perth Motorplex with a massive crowd cramming into the venue to witness this circus of drag racing. From the headlines, it might have looked like another Tremayne whitewash at New Years Thunder, but behind the scenes it was a tough night for the Queensland Pro Stock outfit. Sydney driver Rick Gauci walked away with yet another Aeroflow Outlaw Funny Cars win at Perth Motorplex on Saturday night, driving to an impressive 5.468 second run in the final round to wrap up the victory. Two reigning 400 Thunder champions who have thus far struggled for the season got their series defences back on track with wins at Willowbank Raceway's New Years Thunder on Saturday night. Pro Bike saw a first time victor at New Years Thunder with Western Australia's Ryan Learmonth taking his first 400 Thunder event over Daniel Rabnott. Anyone who is familiar with South Coast Raceway would be familiar with Greg ‘Dutchy’ Holland, the long-time committee member, former Vice President and track commentator. Ashley Sanford knocked out the quickest time for Top Fuel in pre-event testing for New Years Thunder at Willowbank Raceway, while John Zappia set a hot pace in the Pro Slammers.